Jean K. Montgomery, 100 years old, entered eternal life on August 22, 2018 at Maple Manor Christian Home in Sellersburg. She was a member of the Sellersburg United Methodist Church, an avid square dancer and quilter, loved her family and loved to travel. Jean had many occupations over the years. 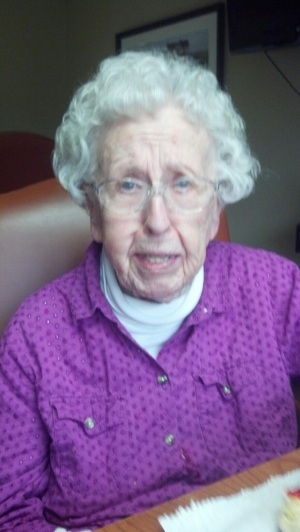 She retired from Seinshiemers, an inspector for Phillip Morris and receptionist for Dr. Bill Lee’s Dental Office. Jean was preceded in death by her husband, Eugene Montgomery, her sister, Dorothea Lawrence and her twin sister, Rae Dixon. Surviving are her daughters, Judith (George) Gerth, Sellersburg, Karen (Steve) Balmer, Floyds Knobs, Ruth E. Montgomery and her husband Jim Harper, North Lewisburg, Ohio, sister, Lois Hall, Charlestown, four grandchildren and eight, great-grandchildren. Funeral services will be held 11AM Wednesday August 29th at the Garr Funeral Home in Sellersburg with burial to follow at Kraft-Graceland Memorial Park in New Albany. Visitation will be Tuesday from 4-8PM and anytime after 9AM until the time of service on Wednesday. In lieu of flowers, memorial donations can be made to the American Cancer Society, P.O. Box 22718, Oklahoma City, Oklahoma 73123. Online condolences can be made at www.garrfuneralservices.com.